Primarily a back street locals pub but it does pull in a few passers by after work. I've found a friendly atmosphere on my few visits here and reasonable prices. This place is my first choice for when I'm in the area. Found this place a block or so from my hotel. Another back street local's pub, blokes playing cards and bantering solidly. Very pretty barmaid. I had a pint of Golden Hen (I think), 3.70, which was okay. A bit insular compared to McGlynn's nearby, I doubt tourists seek it out. Proper Irish backstreet boozer. Friendly but a bit of a barn as obviously opened out some years ago. Plenty of bric-a-brac attempts to inject character. No real ale. 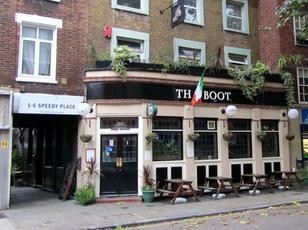 A back street pub in the area just south of Kings Cross the Boot has a heavy Irish influence and a warm environment. Lots of bric-a-brac on the walls and over the bar. A downside for ale lovers is that there is nothing on pump - if you don't want lager then it's either Guinness or Caffreys. Plenty of food was being served when I was in - basic stuff but looked and smelt pretty good to me. 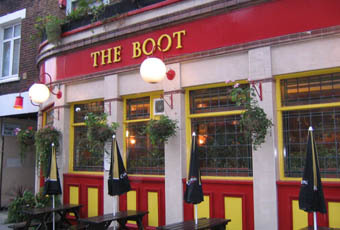 If you are in the area and want somewhere cosy for an evening the Boot certainly fits the bill. The lack of real ale might deter some but I can certainly recommend this place if in the area. Basic Irish-run pub with no real ale, pub grub, surprisingly full on a wet Sunday afternoon, so must be doing something right.